Resident Roger Strahan warned Charlotte County commissioners they could be voted out of office if they go ahead with the large increase in sewer and water rates. The board ultimately approved three instead of five years of increases. 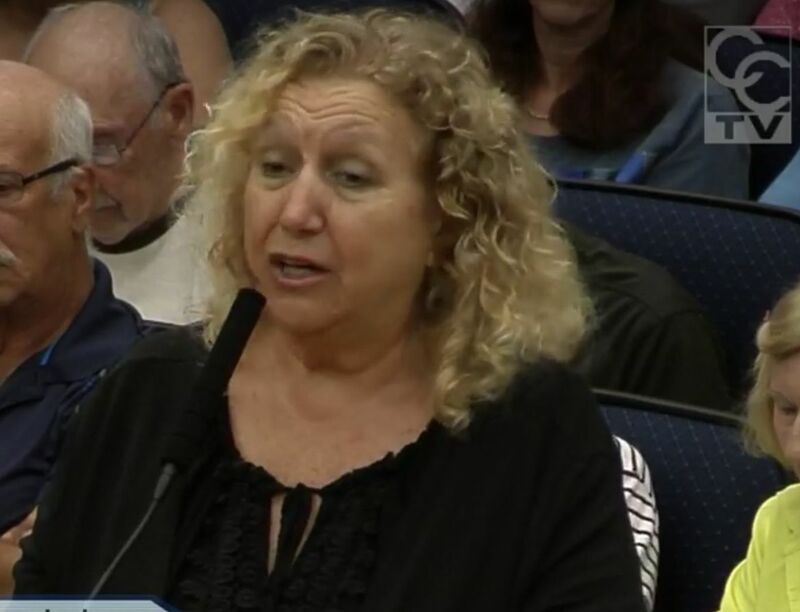 Why not sell Charlotte County Utilities to a private buyer, asked resident Karyn Chauve, who was one of many to suggest this at a public hearing on new water and sewer rates on Feb. 12. She said she fears she will have to leave her home in Charlotte County if water and sewer rates become too high. Two hours of angry testimony persuaded Charlotte County Commissioners to drop the last two years of planned water and sewer rate increases. That leaves three years of 7 percent rate increases — the first to take effect on April 1. The board voted unanimously Tuesday to drop two years of 5 percent rate increases that would have taken effect in 2022 and 2023. They approved the first three years of 7 percent increases. That was what consultants had recommended. Most of the packed auditorium had left by the time commissioners took their vote. One resident, Lauren Schweer, said the decision to eliminate the last two years of increases was only a modest improvement. “It’s better than having the two 5 percent years, but still, it’s an ungodly amount of money,” she said of the overall increase. With Tuesday’s vote, combined rates for a standard household (4,000 gallons of water a month) will rise from the current $92.69 to $99.16 in April. That will increase to $106.09 in 2020 and $113.51 in 2021. In the plan that commissioners discarded, the combined monthly rates for a standard household would have risen to $125.15 by 2023. Reaction by residents was intense, given that the county rates are already among the highest in the region. Commissioners were accused of having delusions of grandeur, of arrogance, of incompetence, and of indifference. All of the official explanations seemed to leave residents more angry. Residents said they resent being asked to pay for new growth; however, commissioners denied this. Developers pay for their own water and sewer systems, Commissioner Bill Truex said, and then pay again to connect to the larger system. Residents urged commissioners to sell Charlotte County Utilities to a private company. Tiseo also deflated another suggestion from residents when he said it is not legal to use the state sales tax to pay for utility projects. Two out of about 40 residents spoke in praise of the rate increase and a few others thanked commissioners for extending the sewer system. "We're all going to be out there panhandling to pay for water and sewer." - Kathleen Coppola, resident and Punta Gorda Airport Commissioner.